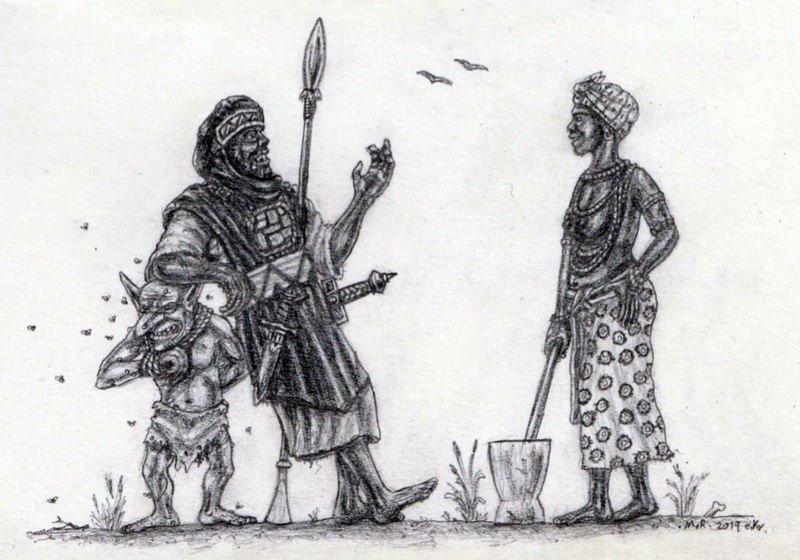 There has been a lot of brainstorming and homebrew development for the Ninth Age's version of the rich empires of Ghana, Mali and Songhai in West Africa, all ruled from the saddle by mighty warriors and slavers. This is one example of something that might have chafed for a community project to introduce into Warhammer Fantasy. If you like the sounds of salt, gold, slaves and lordly riders, then check out the link above! Some laidback smalltalk somewhere in western Taphria, in lands under the imperial reign of the Koghi, with a handy armrest for the brave warrior and dauntless slaver to lean on. Entry in T9A's Art Contest II. Please share ideas of your own for this great Southron power!